Super gentle cow ! 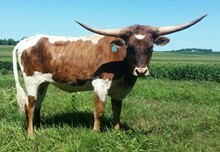 great producer,large body and a Beauty in the pasture ! Bred to Tuff as Nails for a July calf. Big beautiful brindle twisty horn cow . She is super gentle and a easy keeper. She gave me a great 2016 heifer again this year.